Welcome to the 2013 Category Challenge! The idea is to read books from different categories. Tradition dictates that it should be 13 categories this year, but that is in no way a requirement (hence the group name change). They can be any categories you want and you can read as many books as you want from each category. Or you can do something completely different - the parameters are intentionally very wide. The challenge officially begins on January 1, 2013, but starting early or late is welcomed. If you want to participate in the Sandman Group Read, click here. 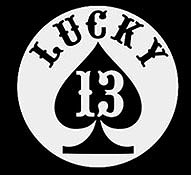 It is in a separate group since all the threads needed would inundate the 13-in-13.